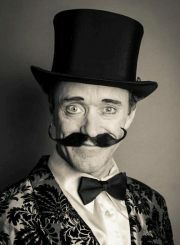 Kevin’s Sylvester Dickey character has been a beloved Moisture Festival host for a decade. An actor, host, show producer and musician, Kevin composed the Festival’s interactive “Moisture Song”, with the memorable line, “Nuns in a cloister!” which begins variety shows he hosts. With his wife Martha Enson he runs EnJoy Productions, producing diverse live entertainment for corporate and special events. In the late 80’s he co-founded UMO Ensemble, and has performed and directed with Teatro Zinzanni for 15 years. Sylvester Dickey and Kevin collaborate in corporate leadership trainings called “Damn Straight Communication” (call him today to disrupt a company near you!). Creator and Host of the variety show Big Night Out on the Seattle Channel, Kevin is an avid singer/songwriter, whose CD “Say It” is available on iTunes. He lives with his wife Martha, teenage daughter Ruby, and two trouble-making dogs on Vashon island.